Have you ever found yourself drawn to something without knowing very much about it? Well, that’s how I felt with Eatery JHB. I read a short review of this up and coming Joburg star in Taste magazine a few months back and my heart was truly captured. I couldn’t wait to suggest it for our next dinner club, but unfortunately we had a few places on the waiting list so Eatery was placed on the back burner. I asked the courteous question of “Where would everyone like to go” but I already knew the answer. So despite several random suggestions, I got my way (naturally) and a night at Eatery JHB was planned. Team: 8 avid restauranteerers. To those who couldn’t make it – you seriously missed out. Décor: I’ve mentioned before that I love the deconstructed look, and it was like Eatery had read my mind. The restaurant is a converted car workshop and has been left in its rustic state.Think bare walls with the tiles pulled off and exposed wooden roof beams. Fabulous lighting and simple tables and chairs provide a welcome relief from the satin and suede of some of today’s pompous restaurants. Oh and the kitchen is open plan, which my nosey personality just adores. on the corner of Victoria. Although it may miss out on the stream of traffic going past each day, I think it benefits from being a little discreet in its location. It’s a place you plan to go to for the food, not one you simply walk past or pop in to. If you’re looking for a place with loud music, big crowds and cocktails, stop reading now. If, like me, you choose a place based on the food, then please bear in mind that Eatery is only a 40-seater and you will have to book. Service: Started off great (discreet and competent) but dwindled towards the end of the evening. Orders are taken by a manager and there is also a waiter assisting. The menu is small and concise so no real explanation was needed in that regard. Both the manager and waiter were absent when we needed to order dessert and get the bill so a bit of time was spent trying to catch their eye, but other than that there were no complaints. Note: a discretionary service charge is added to your bill – 12.5%. Food: Everything is fresh so the menu changes often according to produce availability. There is a choice of 3 starters, 3 mains and 3 desserts and everything is wonderfully priced. There was no beef on offer which I initially thought to be a bit disappointing but it really wasn’t missed. (The boyf didn’t even miss it and he is a die-hard beef fan). We really tried to make sure everything on offer was sampled, but alas the team faltered. 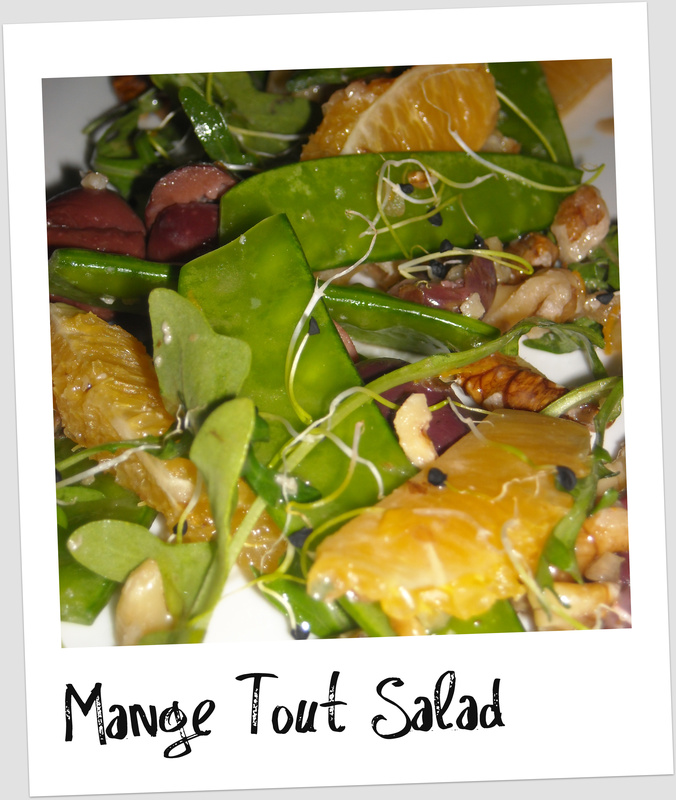 Mange tout salad. The boyf was the only one who ordered the salad to start (I promised I wouldn’t make comments about the girlyness of his choice so I wont). Mange tout served with olives, orange segments and walnuts. It was a wonderful combo and something that I will definitely attempt to recreate at home. 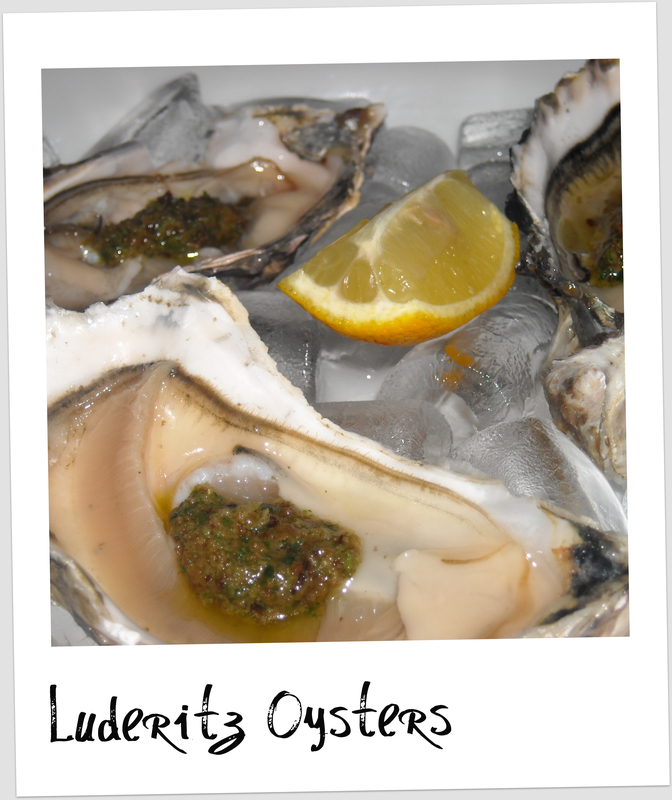 Luderitz Oysters. I found it pretty tough to choose between the flatbread or the oysters. 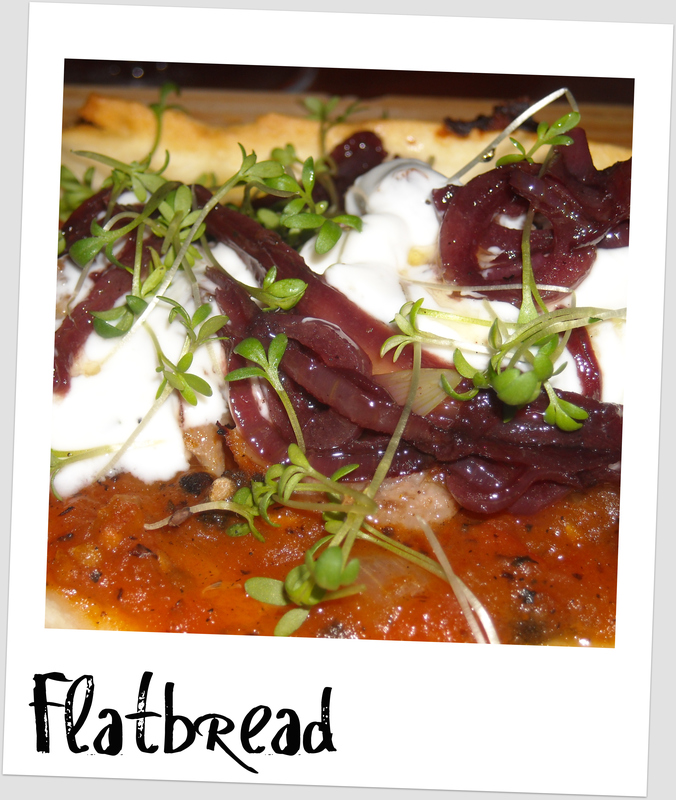 When we were told that there were only 3 oysters in a portion, the pig in me prevailed and I went with the flatbread. Dom ordered the oysters and I felt a twinge of jealousy when the massive beauties were placed before her. Three of the biggest Namibian oysters I have ever seen, served on ice and dressed with a little dollop of salsa. They looked amazing! I chose the tapenade (olive pate) stuffed chicken served on rosemary tagliatelle with ratatouille. 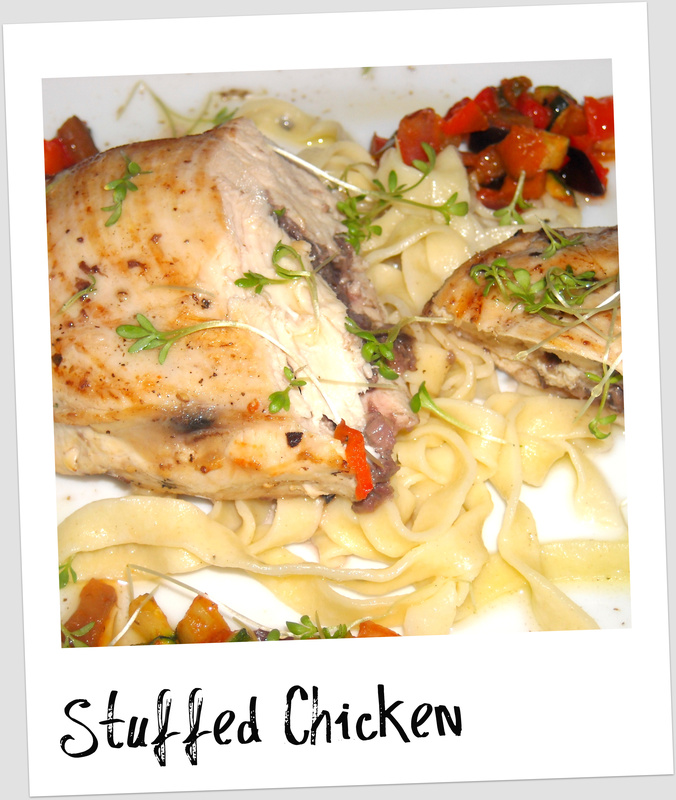 Moist, flavourful chicken packed with salty olive, you can’t really go wrong. I found the pasta a little bit dry but once I mixed it with the ratatouille it was fantastic. The portion size was fantastic as well, and although the menu offered side dishes (R15) they definitely weren’t needed. A table favorite, and my nominee for dish of the night, was the hake and mussels served with chorizo and black beans. I can say, without a shadow of a doubt that this was on the best fish dishes I have ever tasted. The mussels were cooked to perfection – just on the border of under cook and required pretty much no chewing (great for the old folks). Hake isn’t a fish I would readily choose in a restaurant, but cooked like this – magic. Chances are it won’t be on the menu for very long so I might have to rush back to order it all for myself. The third option was a spinach and ricotta roulade served with smoked tomato sauce. As delicious as it sounded, no one at our table ordered it so I can’t really comment. I’m sure it’s equally as tasty. 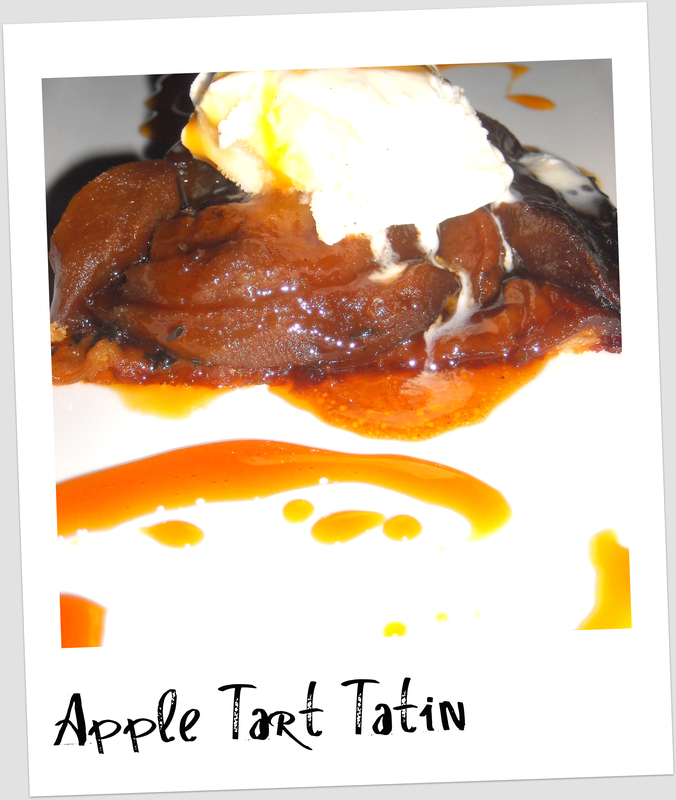 Chocolate panna cotta or apple& thyme tart tatin. I chose the panna cotta which means the boyf had to have the tart tatin. The rest of the table also chose the above two dishes, leaving the cheese board a-begging. I generally won’t order panna cotta. I don’t like jelly at the best of times, and I certainly don’t like jelly made of cream, but I thought I would give it a whirl. Boy, am I glad I did. 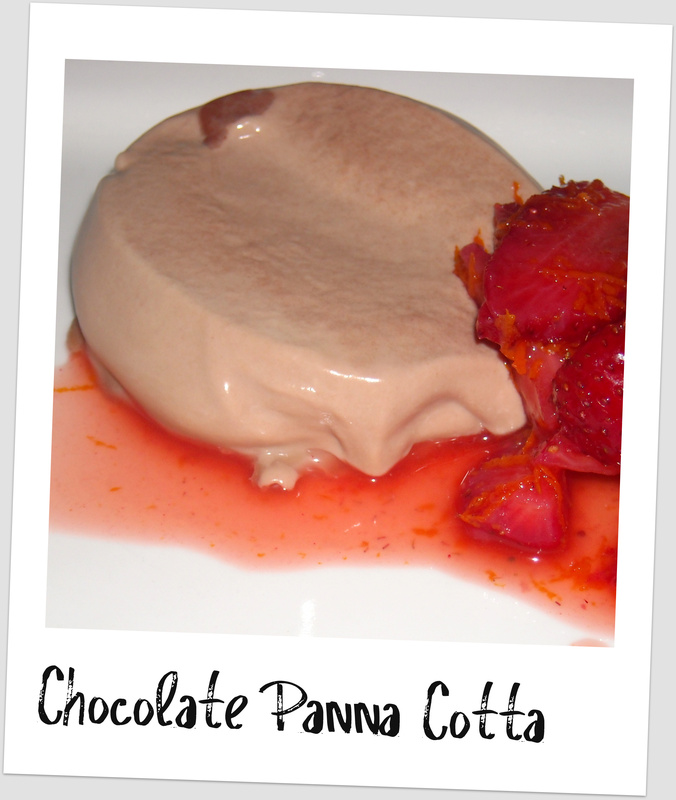 Best panna cotta. Ever! It was barely set so was more a light mousse in texture but packed a massive flavour punch. It was served with Cointreau marinated strawberries – I could have eaten an entire bowl of just these. found the sugary caramel to have a slight burnt flavour. Although apple and thyme is a great combo, it made the dish too savory in my opinion. It was tasty for sure, but no competition for the panna cotta. Eatery Jhb…. I salute you!